As stated previously, RVF is an arbovirus, transmitted transovarially by Aedes mosquitoes of the Neomelaniconium group. These mosquitoes breed in the temporary floodwater pools and floodplains that occur throughout the range of the Rift Valley. They are found in tropical forest, Guinean and Sudanese zones and out into the semi-arid and arid zones wherever these are associated with alluvial riverine floodplains. Flooding is clearly dependent upon rainfall patterns and occurs frequently in the moist high rainfall zones and infrequently in the arid and semi-arid zones. However, forest zones where annual or biannual emergence of RVF virus infected vectors may occur, do not have susceptible disease hosts to act as indicators of RVF virus activity. These are found principally in the bushed and wooded grasslands and semi-arid zones, which occur throughout the African continent to the north and south. It is in the latter zones that RVF is an epizootic disease problem. Epizootic virus activity has been associated with periods of more than average persistent heavy rainfall. This raises the water table to a level where the water pans, dambo, walo or dieri, as they are called in different parts of the continent, are flooded. These floods last for several weeks. Riverine floodplains may be flooded as a result of distant rainfall in their catchment areas and not as a result of local rains. 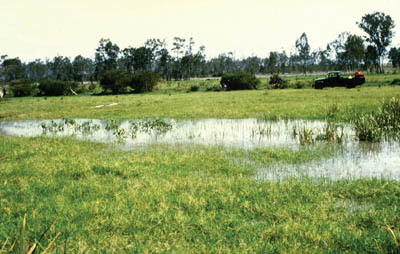 This flooding results in the emergence of a single generation of Aedes (Neomelaniconium) mosquitoes, such as A. lineatopennis, macintoshi and vexans. A proportion of these mosquitoes may be infected with the RVF virus and seed the virus in ruminants or camels that are exposed when they drink from or feed close to the water pools. Whether these infections generate into epizootics depends upon the water pools remaining for four to six weeks or more, thus enabling the secondary vector mosquitoes to breed rapidly and generate the huge mosquito populations seen during RVF epizootic periods. These mosquitoes are of several genera: Culex, Anopheles, Aedes (Stegomyia) and Mansonia. It is also known that other biting flies may transmit the RVF virus mechanically. The most predominant flying needles are likely to be Culicoides spp., Stomoxys spp. and tabanids. Glossina spp. (tsetse flies) can also transmit RVF mechanically. The climatic conditions that predispose major RVF epizootics are likely to be of a regional nature. Determinants of climate such as the intertropical convergence zone (ITCZ) are continental features. This explains the simultaneous multifocal origin of RVF during the early days of an epizootic. The disease does not spread in the manner of classical contagious diseases. It occurs in several countries in a region at one and the same time. Some local spread may occur from the initial foci through the movement of infected vectors, but epizootic RVF virus activity requires the presence of huge numbers of vectors and the potential for this to occur is clearly limited. The disease persists for periods of 8-16 weeks, when the infection rate may decline and disappear. The full epidemic curve is often completed in 16-20 weeks in semi-arid and arid situations but cases may continue to occur for one to two years in more temperate coastal or moist highland areas. RVF has not been known to spread by the movement of infected animals from infected to uninfected areas. However, in theory this could happen and has in fact been put forward as the mechanism for the occurrence of the disease in Egypt and the Arabian Peninsula, although there is no evidence to support this idea. The globalization of trade and the reduction in transportation times have also created new possibilities of disease spread that must be taken into consideration in the epidemiology of transboundary animal diseases. Direct animal to animal or contact transmission of RVF has been difficult to demonstrate. There is no evidence from the field that this transmission route is significant in epizootics. Movement of a flock of infected and susceptible sheep away from the mosquito challenge results in the complete disappearance of RVF within days. RVF is a vector-propagated virus disease in animals.